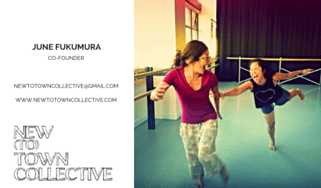 June Fukumura is an emerging, Japanese-Canadian theatre artist with a Bachelor of Fine Arts (First Class Honors) in Theatre Performance and a Certificate in Sustainable Community Development from Simon Fraser University (2016). June is the Co-Artistic Director of Popcorn Galaxies, an emerging theatre company interested in re-enchanting the everyday through unconventional site-specific works. Popcorn Galaxies has independently produced ten successful shows in four years including – Paper Dream (June, 2017); Apocalypse Parade (2016); Hold on Tightly (2014); and Radiant Thing (2013). The most recent production, Scatter (Aug, 2017) was a community engaged eco-art installation at the Pandora Park Field House in collaboration with the Dance Troupe Practice. June is also the Co-Founder of New(to)Town Collective, an emerging artist collective with a mandate to provide on going accessible physical theatre training and experimental research workshops for artists in Vancouver. The Collective’s core intension is to promote interdisciplinary collaboration and cross-pollination of ideas in the artistic community. In 2016, June received the Early Career Development Internship Grant to work with Theatre Replacement as the Associate Producer Intern. In this capacity, she has helped produce the annual public programs: PuSH OFF, New Aesthetics Performance Intensive, and PantoLand summer camp for children. Her artistic training includes physical theatre, clowning, contemporary dance, performance art, directing, dramaturgy, and devised theatre. Her artistic practice is a unique blend of experimental contemporary theatre, site-specific community engaged arts, and somatic performance techniques.